Place 2.5 cups water in a medium pot, cover and bring to the boil. Add 1 cup rice, cover, and reduce heat to low. Simmer until rice is cooked, about 35-40 minutes. Drain rice. Set aside to cool. Meanwhile, in a medium-size bowl combine salmon, salt reduced soy sauce, sesame oil, ginger and garlic. Stir well to combine. Marinate for 30 minutes in the fridge. 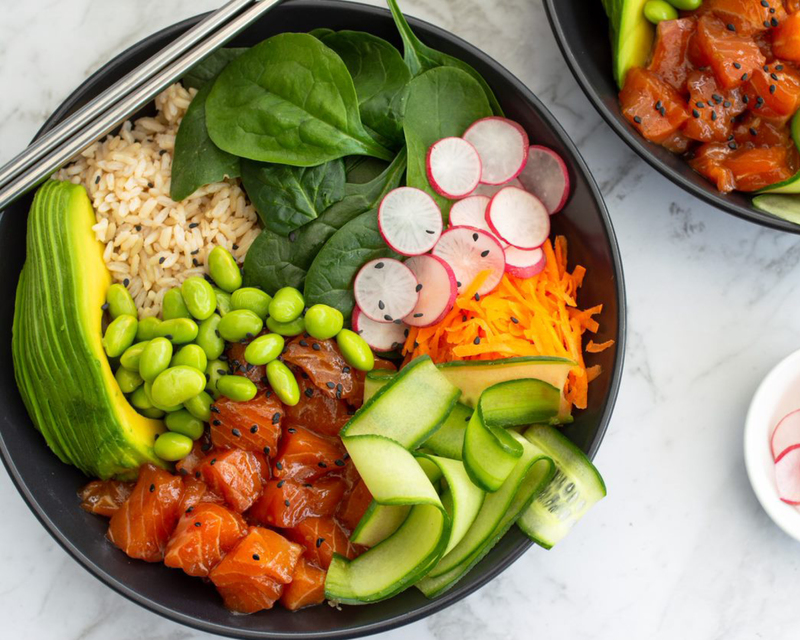 Divide rice, edamame beans, cucumber, radishes, avocado, carrots, spinach and salmon between 4 bowls. Sprinkle with black sesame seeds. Tip: Shredded cooked chicken breast, tuna or tofu can be substituted for salmon. Quinoa can be substituted for brown rice.